Green Thermal Energy is focused entirely on providing energy efficient refrigeration systems, this means that the company is extremely well placed to provide refrigeration based heating and high temperature CO2 based potable hot water systems. Green Thermal Energy provide the commercial specifier or end user with a complete end to end service from heat pump system specification through to installation for retrofit or new build applications. Green Thermal Energy Heating system application and design formats can incorporate heat recovery from a cooling system or the primary heat pump can solely provide thermal energy only. 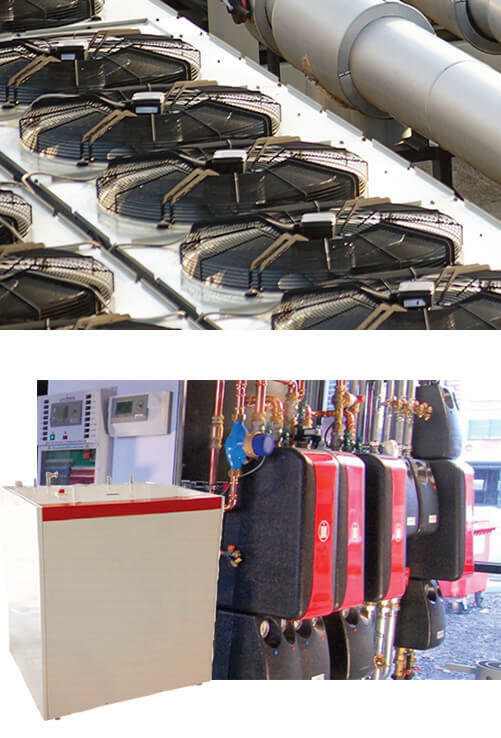 CO2 heat pump systems are able to provide 80°C hot water output temperatures which are ideal for applications where a large capacity of hot water is required to meet a large hot water demand on a batch production basis. Commercial and industrial heat pumps are now accepted as being a real alternative to fossil fuel boiler systems and can enable the user to achieve significant fuel cost reductions along with achieving real reductions in carbon emissions. New build or retrofit projects can benefit by installing either a primary heat pump system or a hybrid heat pump system that operates in synch with other heat sources. Green Thermal Energy are able to provide a full technical project overview along with delivering system proposals that match an available budget with the highest return on investment. Green Thermal Energy specialises in the application of CO2 hot water generation systems. Our design capabilities ensure the best performance available. Due to this specialist approach a high temperature Green Thermal Energy CO2 heat pump providing potable hot water to a 4,000 litre thermal store is able to achieve an efficiency level of 300% at an 80°C output temperature, this compares very favourable with a fossil fuel boiler which only operates with an efficiency level of 90% at the same conditions. The Green Thermal Energy design and specification service is delivered by experienced heating industry professionals who have an in depth knowledge of how to correctly apply refrigeration based heating systems, whether on a direct evaporation or water-based system. The Green Thermal Energy approach is based around providing commercial or industrial specifiers and end users with a real understanding of the available options in order to maximise the cost and carbon savings that can be generated from any available budget. The Green Thermal Energy –TWIN ENERGY Chiller Hot Water Generator (CHWG) represents an exciting development with regard to providing low energy cooling and heating for industrial, process and HVAC applications. Combining proven technology with practical common sense engineering reduces energy costs and carbon emissions. Historically we see the duplication of energy in many applications and industry sectors. By this we mean that energy is used to provide cooling, but the valuable thermal energy that is produced as a by-product of the cooling process is simply rejected as waste into the atmosphere. We know that the process of refrigeration is simply a means of transferring energy from one place to another. We transfer valuable energy from cooling directly to waste, and importantly, we do not normally attempt to recycle this high cost waste energy from cooling. The GTE–TWIN ENERGY Chiller Hot Water Generator enables this waste energy to be recycled and used again on site to produce high temperature hot water. Existing or new facilities can now benefit from significantly reduced energy costs by incorporating a TWIN ENERGY system into their installation. In basic terms the GTE-TWIN ENERGY provides simultaneous cooling and hot water outputs using 50% of the energy that would normally be required. For example if an application requires 100kW of cooling and also requires 100kW of energy to produce stored hot water i.e. total 200kW, the TWIN ENERGY will satisfy both requirements but will only require the input power to satisfy 100kW of cooling i.e. circa 30kW. This is achieved by a combination of CO2 cooling and heating technology in which the total rejected heat from the cooling process is recycled into high temperature 70°C hot water. The GTE-TWIN ENERGY UNIT allows the cooling input energy to be used twice, but importantly the recycled second time use energy provided for hot water production is virtually FREE and virtually ZERO CARBON. 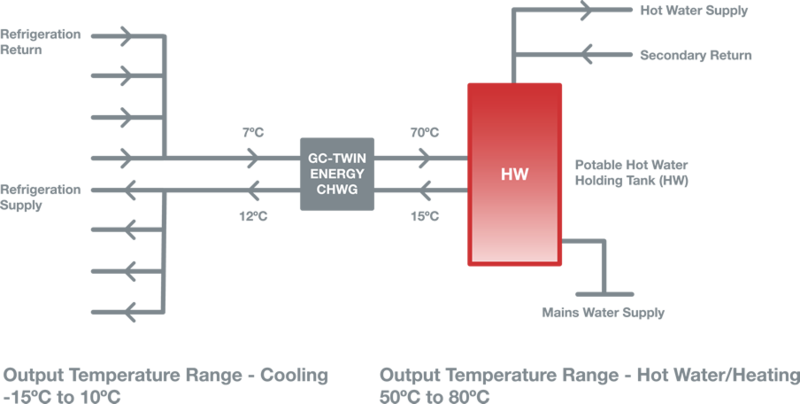 Even when cooling loads are reduced and there is no cooling load to recycle, the GTE-TWIN ENERGY will still produce low cost and low energy hot water by extracting renewable heat from atmosphere at high efficiency. Similarly if the hot water demand is satisfied and as a last resort, the GTE-TWIN ENERGY can be configured to reject heat to atmosphere. The GTE-TWIN ENERGY provides a practical and proven means of producing cooling and hot water 52 weeks of the year. The practical potential for both new and retrofit-replacement applications means that the TWIN ENERGY is becoming an attractive alternative to expensive and high energy use direct gas and electric hot water production. The second time use of recycled energy is now recognised as being of higher benefit & value than energy produced from renewable means. Why accept waste when valuable rejected cooling energy can be recycled & used again on site by installing a Green Thermal Energy TWIN ENERGY system. *Efficiency will be dependent on individual project conditions and requirements, an individual illustration can be provided with regard to capital cost, operational costs and return on capital, based on actual site specific information.